In December 2008, Barclay’s introduced the Visa Black Card. The Visa Black Card is marketed as an exclusive credit card with touted perks including premium concierge service, luxury gifts, cash back and points program, as well as a special black card made out of carbon. 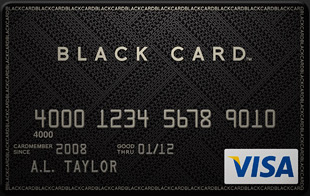 The “Black Card” concept itself originated from, and is trademarked in 2005 by Thinktank Holdings, LLC which is owned by Scott Blum (Buy.com founder). The original black card press release is here. Visa specifically cites the following on their official website blackcard.com, where you can also apply. 24-Hour Concierge Service – Read full Visa Black Card Concierge details here. Exclusive Rewards Program – Includes Priority Pass Membership. The Visa Black Card marketing literature initially targeted an exclusive 1% in order to be able to service at a higher level, some of the demographics we have collected on Visa Black Card users are here, although new marketing information from Visa Black Card shows their target is the top third of the population. Here is a write up of the Visa Black Card vs The American Express Centurion Card, and also a chart detailing the “Black Card” abundant benefit differences.